Our group participated in the five-day Nanochemistry and Nanomaterials Explorer camp organized by the Nebraska EPSCoR Young Nebraska Scientists (YNS) program. Participating middle school students learnt about the fundamental properties of nanomaterials, including hands-on experience with the chemistry that is used to prepare, modify, and analyze nanomaterials. understanding the structure and properties of carbon nanotubes and fullerenes. …and then explains students how fullerene consists of five- and six-membered rings and how to properly make such model. Dr. Sinitskii, graduate student Peter Wilson (center, in a check shirt), and Dr. Alexandra Fursina (right) supervise students’ work. Our group participates in annual NanoDays that offer fun educational activities about nanoscale science. The event is organized by Nebraska Center for Materials and Nanoscience (NCMN) in collaboration with Nebraska EPSCoR and the University of Nebraska’s Materials Research Science and Engineering Center (MRSEC). 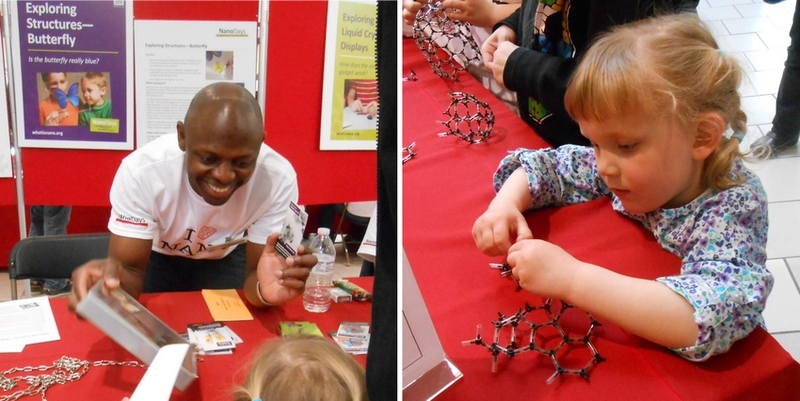 In 2013, Nanodays took place in Lincoln’s Gateway Mall on Saturday, April 6, 1:00 – 4:00 pm and included 10 stations that featured 15 interactive demonstrations and two games to engage people of all ages. Nanodays celebrations bring university researchers, staff and students together with science educators to create learning experiences for both children and adults to explore the miniscule world of atoms, molecules, and nanoscale forces. NanoDays-2013. (left) Graduate student Gilbert Mbah demonstrates a Morpho didius butterfly with beautiful iridescent wings and explains principles of optical diffraction. (right) Young scientist assembles a fullerene model. The Department of Chemistry organizes annual Chemistry days for the Lincoln area high school students and their parents to acquaint them with the departmental research programs and encourage students to pursue their interest in science. Every year we provide tours of our lab to several groups of students and their parents and discuss our research on carbon nanomaterials. Chemistry Day – 2014. (left) Graduate student Ross Netusil (in the center) demonstrates graphene exfoliation using a Scotch tape. (right) Graduate student Mikhail Shekhirev (far right) talks about the principle of scanning electron microscopy. 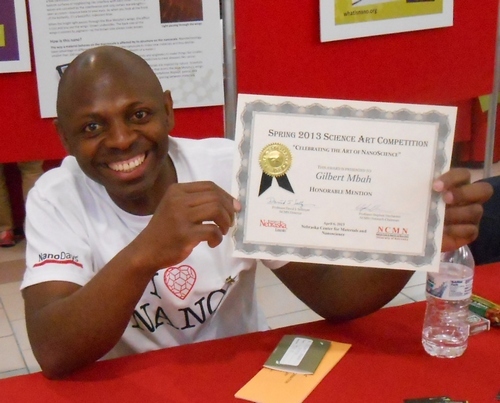 Graduate student Gilbert Mbah with a Honorable Mention diploma.